We seek to lead children into a growing relationship with Christ by creating environments in which children are encouraged to pursue friendship with God, make friends healthy connections with adults and peers, understand their God-given gifts and begin to use them, and positively affect their friends who do not know Jesus, including people of diverse cultures and lands. given the opportunity to experience God’s love and forgiveness by trained and caring adults of various ages. taught Bible lessons with practical applications. taught how to make healthy connections with multi-age adults and teens. taught about spiritual gifts and how they can use theirs. instructed in how to relate Christ to their friends in everyday situations and develop a concern for people of other cultures. 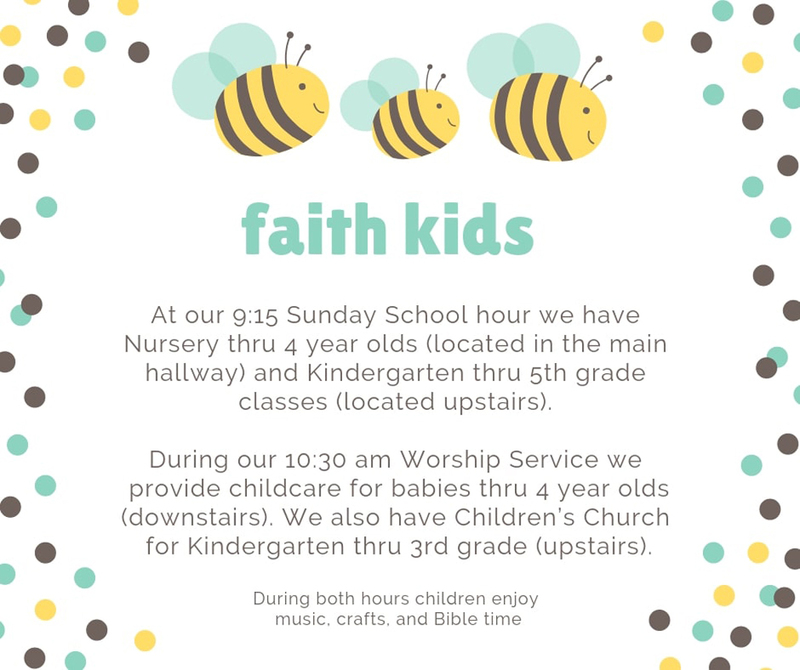 These are accomplished through Sunday School for all ages 0-12 years, AWANA, Children’s Church and a variety of special events and trainings. It is our highest priority to have volunteers who know and love the Lord; who feel called by God to this vital ministry; and who establish positive, healthy relationships with the children of Faith Baptist Church and its visitors. Training is provided and is a must if you desire to mold our little ones, directing them to a growing relationship with Christ. To express your desire to serve, please complete a Faith Kids Volunteer Registration Form obtained from our Children’s Director.